ANCHORAGE, Alaska, USACompleted in September 2014 at a cost of $109 million, the new Alaska Airlines Center is located on the University of Alaska Anchorage (UAA) campus and hosts the UAA Seawolves basketball and volleyball teams as well as concerts and other events. The sports complex includes a 5,000-seat arena, a 1,200-seat gymnasium and gymnastics practice facility, five luxury suites, the university's athletic department offices, a restaurant and other areas. A/V consulting firm Sparling, a Stantec Company oversaw the installation of a HARMAN Professional audio system for the new complex, which involved working hand in hand with a number of outside contractors. Sparling did the acoustical, audio/video and lighting consulting for the arena, working with Anchorage architects McCool, Carson Green, Anchorage electrical contractor Alcan Electric and A/V systems contractor Dimensional Communications of Mount Vernon, Washington. In addition, Sparling coordinated the video board head-end design/build with New York digital display manufacturer Daktronics. Because of Alaska labor rules Alcan Electric was in charge of the audio/video installation. "Alcan subcontracted a portion of the installation to Dimensional, which turned out to be a really good partnership between the local electrical and the specialized A/V contractor," said Stephen Malone, Senior Technology Consultant, Audio/Visual Systems at Sparling. "This arrangement saved the client a ton of money." "In our system designs we try not to mix manufacturers – it's a fundamental design premise for us," Malone added. "HARMAN covers the majority of our system requirements from microphone to loudspeakers, which is a tremendous advantage." Malone and his team installed eight JBL PD Series loudspeakers in the arena. "We chose the JBL PD Series because they're specifically designed for arena sound reinforcement. In particular, we had limited space to place the main speaker cluster because of the shortness of the scoreboard's height and the fact that the scoreboard moves." Malone found the ideal solution in the JBL PD5322 full-range 3-way loudspeaker with the PD5212 LF extension, installed between the moving scoreboard and the structure the scoreboard is attached to. JBL Control 226 ceiling speakers are employed as delay fills under the balcony. "We had a similar situation with the install that we did at the ShoWare Center in Kent [Washington]," Malone noted. "We needed loudspeakers with highly controllable directivity and high power handling from a reduced-size cabinet and the PD Series excels in this type of application." A Soundcraft Vi1 serves as the main mixing console, augmented by a Soundcraft Compact Stagebox for additional portable inputs at concerts and events. "One of the main reasons we chose the Vi1 console, in addition to its sound quality and ability to live on the HARMAN HiQnet Audio Architect™ platform we implemented for this installation, was because of its ease of use and the ease of being able to train an inexperienced staff on how to use it," Malone said. 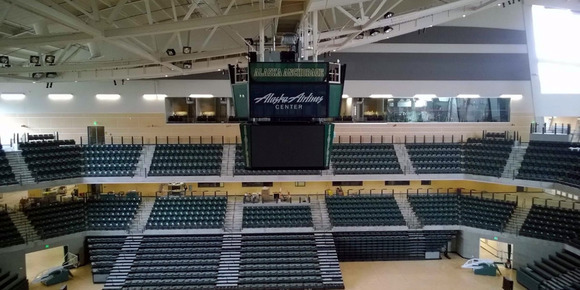 Audio for all the areas in the Alaska Airlines Arena are tied together using BSS Soundweb London components networked via HARMAN's BLU Link audio bus. "In my experience BSS Soundweb London has the best feature set for cost per I/O over other DSP products," said Malone. "The amount of horsepower versus cost per I/O is market-leading." Crown amplifiers provide the power throughout the facility. "We were able to make some adjustments to the amplifier design as the DCi-N series was released after construction started," Malone said. "The cost per networked channel at the power ratings made a reduction of total units needed not only a cost savings, but better matched the required device loads. We were able to realize some efficiencies in power ratings between the two models (CTS and DCi). This means oversized multiple CTS models were replaced with properly sized multichannel DCi models while maintaining digital connectivity from console to DSP to amplifier." AKG WMS4500 Reference Series wireless microphone systems are used for announcements in the main arena because of their Microphone Monitoring feature that interfaces with the Soundcraft Vi1 and enables the mixing engineer to directly monitor the status of the wireless mics from the console's Vistonics™ display screen. "The racks with the wireless mic systems are to the operator's back, so having their status information displayed on the mixing console actually turned out to be a major advantage, not just a convenience," Malone pointed out. AKG WMS450 wireless microphones are employed in other areas of the facility. JBL AM7215/95 loudspeakers cover the seating and court in the gymnasium, and Control 25AV-LS loudspeakers are used in the concourse for background music and fire alarm announcements. "The stadium is set on campus and the concourse is a pedestrian thoroughfare that enables students to walk through the building," said Malone. JBL Control 47C/T ceiling speakers are employed throughout the luxury suites and Control 24CT ceiling speakers are used for paging in the locker room. Most of all, Malone is impressed with the system's performance and flexibility. "Our first concert was a big one, with Tim McGraw," he said. "We were able to easily route the audio to all the luxury suites and throughout the complex with just the right amount of delay so that everything was synched perfectly. Most of all, we really exceeded our expectations for intelligibility and coverage in the main arena and the PA sounded superb."